Trials and Tribulations is a great entry into the Phoenix Wright series and one that all fans should play. Phoenix Wright has been around for a while now, and his latest addition into the series feels like the most fresh and original title yet. With the fanbase of the series slowly growing steadier, Capcom was determined to put out all the stops this time and make Trials and Tribulations the best Phoenix Wright game yet. Although there are some minor annoyances, I can safely say that they have succeeded. 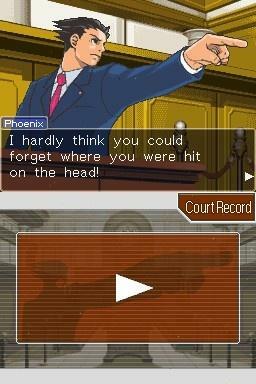 Trials and Tribulations focus more on the history of Phoenix Wright and how he became a popular lawyer. 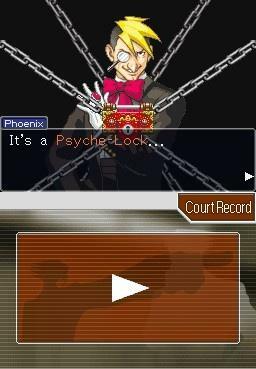 Even in this game, Phoenix is much more recognized by the community and gets busier every day due to the amount of cases he now takes on. As with all Phoenix Wright games, the first trial is a tutorial of sorts which introduces players to either a back-story to a certain character, or events that will lead up to the eventful final case. You will learn much more detailed information of all the characters this time around, and since Trials and Tribulations is the series coup de grace, expect to finally finish off any plot holes or gaps left blank by the past games. From the start of the game you will immediately run into old friends and foes alike. Your faithful partner, Maya Fey, makes a dubious return in high fashion as she constantly makes brain head remarks through every case. Detective Gumshoe is back as well, offering many moments of sleuthing antics that would get any sane and normal investigator sacked on day one. Pearls and Mia Fey, Edgeworth, Larry Butz, an everyone from past games who isn't locked up or dead returns to the foray as well, offering one of the most dynamic and explosive casts in the series. But what makes the cast of characters so appealing are the new crafty ones prominently featured in Trials and Tribulations. Unique characters such as a 300 pound ex-con who speaks with a girly French accent and runs a restaurant to an angry mobster who looks like a tiger that is named...el Tigre. But originality aside, the one character that stands out above the rest is a man named Godot. Nothing is known about Godot when he makes his appearance, yet from the start he constantly harasses Phoenix and makes an unwilling goal to him as well, that he will personally crush and destroy him. Godot makes many appearances throughout the game, and as you commence through the proceedings you will ultimately find out just what his intentions really are, and who he really turns out to be. As with all games, the dialogue in the game is exceptional. Since the entire game is spoken through chat boxes, the wording of the game has to be intricate, yet fun to read at the same time. Capcom has done a tremendous job with the localization and has given life to fictional characters. Besides the hilarious characters and names, what makes the dialogue so pleasing is how witty some of it could be. References to current affairs, computer lingo (with phrases such as w00t! and pwned), sexual entendres and more make every chat engaging and hilarious to read. If you haven't played any of the previous games than you might feel lost during this once considering all of the constant flashbacks and references to past characters and events. In any case, the game plays out like the previous titles, with a short clip showing the crime in question and than you, Phoenix Wright, getting the call to defend a client and gather up information in order to support your case. The formula hasn't changed much, but it's still a brilliantly executed style. As you visit the different locations gathering up information, you will constantly have to search the surroundings for clues. Using the stylus, you can click and point on any part of a particular level and than begin searching. Once you find an important item it gets catalogued in your case journal to be used during the trial or as leverage when questioning someone. Some items might purposely be given to you for story scenarios, but others require you to actually spend time looking around for something out of the ordinary, which is always quite fun to engage. Psychelocks were introduced back in Justice for All, and while they felt rushed and repetitive, offered a nice break from the pace of the game. Trials and Tribulations fixes the problems with psychelocks by given players a much more enhanced incentive on doing investigations and gathering clues. Psychelocks are supposed to represent a person's hidden secrets locked away inside their minds, and once you break the locks you are free to hear their secret. While many of the psychelocks in the game revolve around backtracking for items you need in order to scare someone out of talking, some new psychelocks now force you to talk to other people for information. The repetitiveness is still intact, but at least there are some changes to the formula. The visuals and sound are almost identical to the previous titles, albeit some minor music and sound changes regarding new areas and characters. 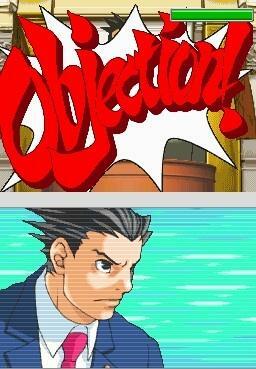 You can still hear all of the characters chime in their own "Objection!" phrases with clarity and precision, as well as see Phoenix point his gaping finger at the opposition as better as before. Some new visual effects allow the game to have a more artistic feel, with backdrops that are more detailed, allowing for more attempts at searching for clues, and animations that have evolved over the years. 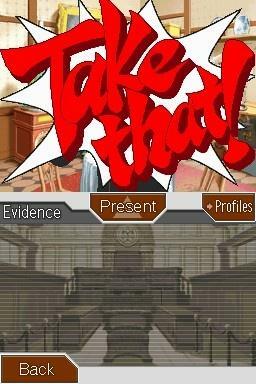 Trials and Tribulations is a great entry into the Phoenix Wright series and one that all fans should play. Newcomers might not appreciate the constant foreshadowing and flashback effects of the game, but the original story and detective elements are key enough to hook any new fans to the game. While the psychelocks still force you to backtrack and some story elements feel shady, the dialogue is as witty as ever and the game, ultimately, is fun to play.